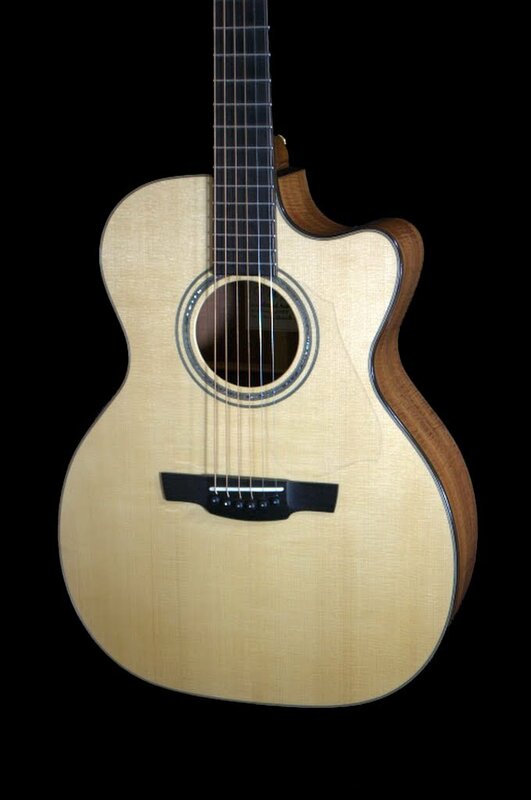 An individually handcrafted guitar should be a guitar for life. It must possess a genuinely large dynamic range or you will ‘grow out of it’. This means that a guitarist can play soft and the instrument is immediately responsive yet full, or the player can dig into the strings hard, especially the treble, and instead of thin metallic scratchiness, the guitar just gets louder, all the while remaining clear and full. Many guitars can sound quite OK when played softly but when dug into, there is no real increase in musical volume, only an increase in extraneous noise. The guitar must be able to stand alone as a true “Solo Instrument”. In the world of “Concert Classical” playing, the guitar is often representing the entire orchestra, so it must be powerful, project well and sound full. This is the same approach I have adopted for my steel string guitars, particularly my 000 models. This is my most popular model and without a doubt my own personal favourite. I enjoy playing the guitar as much as I do building them and I think that if I had to be happy with owning and playing only one guitar for life, then this would definitely be it. In fact I have 3 that I would not part with. One I built back in 05 and 2 recently completed examples. All are available as demonstration guitars. For my Grand Auditorium / Small Jumbo model I was looking to create a guitar that would combine some of the quicker response and middle to top end clarity of my 000/OM models with a boost in low end power and richness.